Review by AllTheBestFights.com: 2015-05-23, some good exchanges between Donald Cerrone and John Makdessi but it is not enough to get three stars: it gets two. Donald Cerrone entered this fight with a professional mma record of 27-6-0 (70% finishing rate) and he is ranked as the No.2 lightweight in the world. He suffered his last defeat in 2013 when he faced current #1 Ufc Lw champion Rafael dos Anjos (=Cerrone vs dos Anjos), since then he has won seven consecutive bouts beating Benson Henderson in his last fight (=Cerrone vs Henderson 3). His opponent, the black belt in karate and tae-kwondo John Makdessi, has a record of 13-3-0 (69% ko/tko victory rate – he has never won via submission) and he entered as the No.62 in the same weight class. He lost to Alan Patrick in 2014 but he came back to win in 2015 against Shane Campbell (=Campbell vs Makdessi). 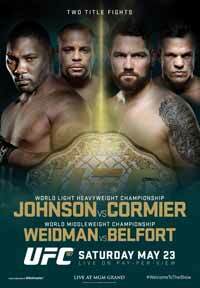 ‘Cowboy’ Cerrone vs Makdessi is on the undercard of Anthony Johnson vs Daniel Cormier – UFC 187. Watch the video and rate this fight!